This past year I had the privilege of marrying my best friend after 10 years of dating. It was a long time coming but I'm so very glad we waited. Our honeymoon descended upon the magical blue waters of the Maldive Islands. 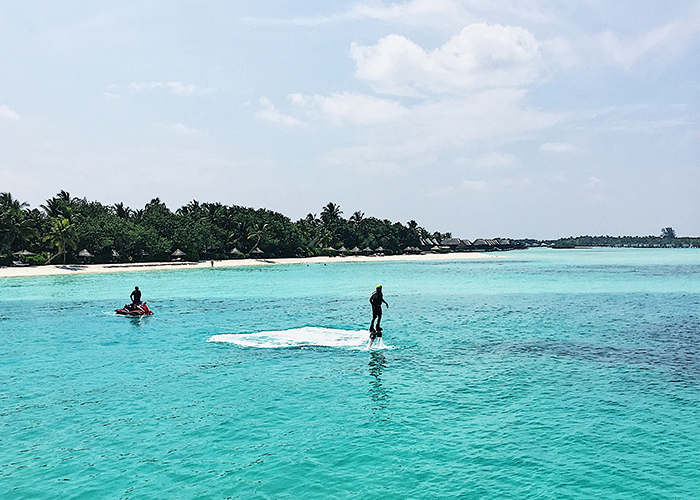 Smack dab in the Indian Ocean, the Maldives was a retreat like no other. The white sandy beaches played as the perfect backdrop for our romantic getaway. We stayed at The Four Seasons: Kuda Huraa, a remote resort that offered both privacy and luxury. Our villa was a bungalow over the water and in the early mornings and late nights, reef sharks, coral fish, and manta rays would swim right up to our dock. The Maldives was definitely one of the most beautiful places I've ever been and I would go back in a heartbeat. If you’re looking for some cool water sports to try, definitely check out Jet-Blading. I have wanted to try it for some time so I finally mustered up the courage and did it. Fueled by a jet ski, it is similar to snowboarding in the sense you are strapped into a board and you are pushed upward to balance off the pressure of water. It was pretty challenging in the beginning but once you get the hang of it and the balance, you can get to some pretty big heights. 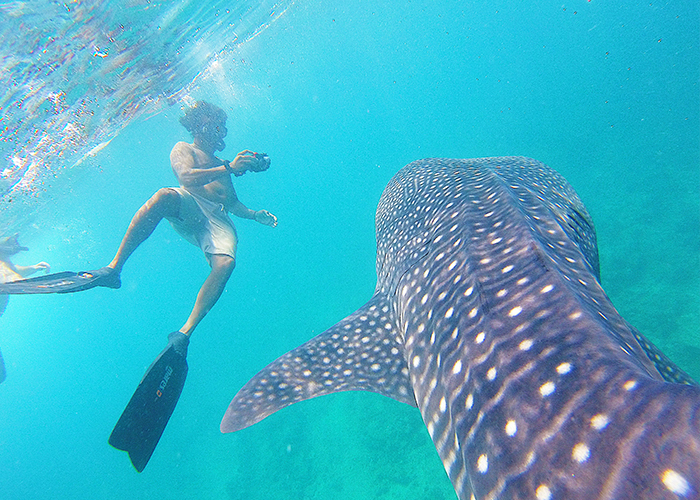 The highlight of the trip was our experience swimming with Whale Sharks. Whale Sharks are known to be the biggest fish in the world and they are gentle giants. Magnificent creatures that are filter feeders (which made us feel safe ha!) and they can weigh up to 48,000 lbs! The South Ari Atoll is the main area where you can find these sharks.